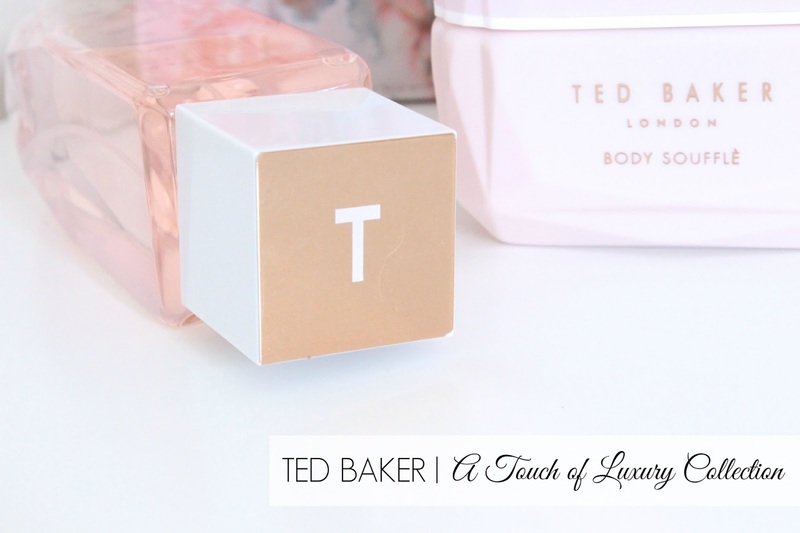 The new Ted Baker 'A Touch of Luxury' Collection is every pastel lovers dream, and the packaging is just to die for. I've been after a Ted Baker makeup bag for months now, however the price coupled with the fact that I rarely use makeup bags has always stopped me from picking one up - however this new collection from Ted's bath and body range means that I get a beautiful vanity case and three full size products for the same price, at only £25.00. Anyone who knows me, knows that I love anything pastel, you only have to open my wardrobe to see the extent of my obsession, so as you can imagine, I love the packaging of this collection. 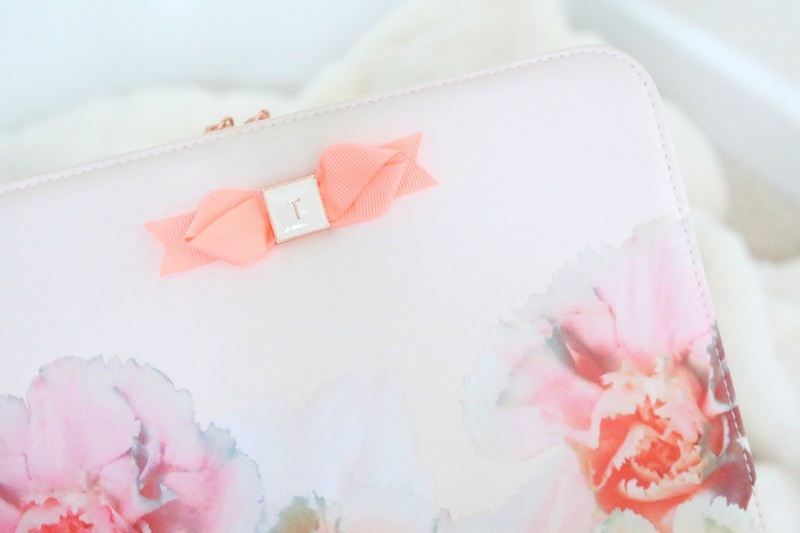 The bag is a pastel pink colour with this gorgeous floral pattern and neon orange and rose gold details in the form of the little 'T' bow on the front. I've never seen a bath and body collection packaged so beautifully, and I will definitely get some great use out of the bag (which is currently being used to store nail polish). Packaging aside, the products are actually really lovely too. The bag comes with three full size products in the form of a Body Soufflé, Body Spray and Body Wash, all in the 'Soft Floral Pink' scent. The Soft Floral Pink scent entwines the soft floral notes of jasmine and neroli, while the base of patchouli, sandalwood and musk complete the scent, creating a beautifully delicate floral scent. I'm not usually a fan of the scents in these kinds of kits, but I actually really love this one and have been keeping the body spray in my handbag for on the go touch ups. 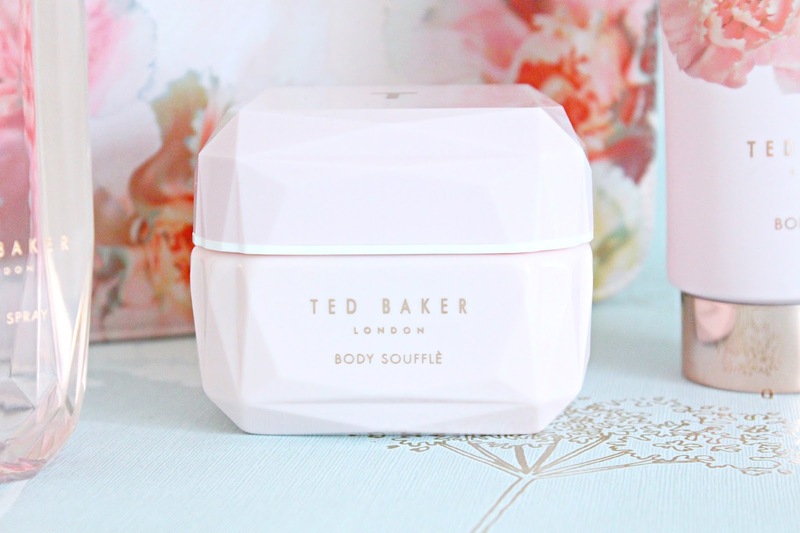 All of the products within the beauty bag are lovely and luxurious, however the real star of the show for me is the Body Soufflé. I'm not normally a fan of body butters, creams, sorbets or soufflés of any kind, as I find they leave my skin feeling sticky and as I apply my body cream before bed, it means that my bedsheets stick to my skin and it just feels awful. However, this offering from Ted Baker is actually brilliant. It sinks into my skin straight away and it means that I can apply my moisturiser directly before bed and avoid any sticky feelings - it also helps that it's super moisturising and smells lovely too. The products in the collection can all be bought separately, and can also be bought in the 'Fruity Floral Mint' scent, which comes with equally gorgeous mint green packaging and would also make the perfect gift for any birthdays you have coming up! I have the body spray and I love it, it's so fresh. The body souffle is next on my list. I'm looking for a new makeup bag and this looks so adorable. I love Ted Baker prints and the pastel and rose gold touch is right up my street! This is so gorgeous. Ted Baker does so well at making such pretty things-I just bought a blush rose cell phone case from him that I absolutely can't keep my eyes off of! I definitely love that bag that comes with it too! I love the packing so much! That soufflé sounds absolutely amazing, but then again, I'm usually a huge fan of such products.